Book a skilled lawn pro in El Reno. Backed by a total satisfaction guarantee and amazing customer support. Just a stone's throw away from downtown Oklahoma City, an outsider would never guess how much there is to see in do in El Reno. From the golf course to the senior citizens center, from the lake to the many parks and pavilions, El Reno is a special place to live that truly feels like its own little community. 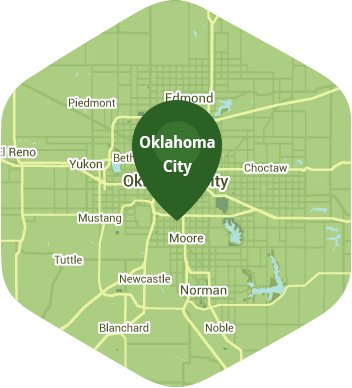 If you have found with so much to do and see in El Reno and Oklahoma City you don't have the time or the energy for lawn care and maintenance, then Lawn Love has the answer for you. Lawn Love is a full-service lawn care company. Our bonded and insured lawn care technicians use their experience and lawn care expertise to turn your little plot of land into a manicured masterpiece. We can do all the weeding, seeding, gardening, trimming, mowing and even aerating that your lawn needs to be lush and beautiful, all you have to do is give us a call! To get started, call Lawn Love today at 405-926-8318 and take advantage of our free, fast and easy two-minute quote and see what a little Lawn Love can do for you! Did a wonderful job trimming the back yard! Awesome job. Would love to have him full time. This was the best lawn job yet! Looks better than it has all year. Can I keep this lawn pro? Even came to mow when it was raining!! Thank you so much! Rated 4.78 / 5 stars in 3,685 El Reno customer reviews. There won't be any rain in El Reno today, which means you'll probably have to water your lawn. Dusk and dawn are the best times to water your lawn (the sun will rise at 6:57 AM and set at 8:06 PM today in El Reno). Here are some average lawn care prices for homes in El Reno. Average lawn size 5,914 sq. ft.